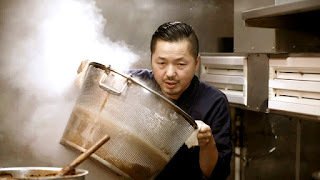 Rotten Tomatoes Plot: In Ramen Heads, Japan's reigning king of ramen, Osamu Tomita takes audiences deep into his world by revealing every single step of his obsessive approach to creating the perfect soup and noodles along with his relentless search for the highest-quality ingredients. In addition to Tomita, the film also profiles five other notable ramen shops, each with its own philosophy and flavor, exemplifying the various different aspects of the ramen world. Mixing in a brief rundown of ramen's historical roots, the film gives viewers an in-depth look at the culture surrounding the unique and beguiling dish. Directed by Koki Shigeno. "It's a feeling like the warm, glowing memory of a lover... ramen." We're not talking Cup Noodles, but rather the Japanese delicacy, where folks line up at 6:30 AM to grab one of 10 precious seats in Tomita's tiny/meticulous eatery. It may be "a casual affair," but the king of ramen's process is anything but. Despite a brief detour to showcase some of his competition, this movie is all about Tomita and his daily commitment/rituals, dishing out "an amazing dining experience... for just $8." Not as pretty as other food documentaries, but delicious in its own right.